The natural beauty and perfect winter climate combine to make the City of Indio the leading city in the region. 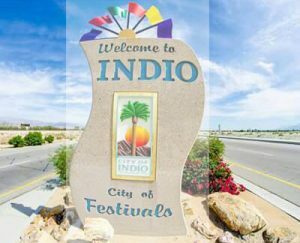 Located in the Coachella Valley in Southern California, Indio spans 30 square miles and is the largest municipality in the Valley, both in area and population. Following significant growth in the region, Indio has seen a 73% increase of residents since 2000. This dramatic growth and success in recent years has required strategic response by City leadership in the upgrade of infrastructure and services. Today the population in Indio is approximately 85,000. Indio has historically been the main population center in the Coachella Valley and continues to serve as the location for Riverside County’s eastern branch offices. The variety of home types available in Indio range from workforce housing to multi-million dollar homes, easily accommodating the housing needs of a wide spectrum of homeowners. Executive housing includes resort style living with condominiums and golf course residences in gated communities.